BOSTON (MyFoxBoston.com) — More than 100 college students from Nigeria who have received full scholarships from their government will be attending college in Boston in the fall. The students are set to attend Northeastern University, and roughly half of them arrived in Boston on Monday. The U.S. Pathway Program, which consists of a consortium of American universities offering an academic preparation program that becomes a pathway to a college degree, and the Nigerian government are working to fund the students' scholarships, which include money for tuition, books, and room and board. 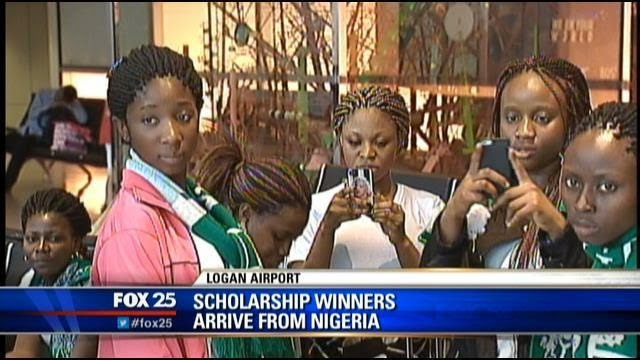 Fifty-three of the 125 students selected to participate in the program arrived in Boston on Monday accompanied by a Nigerian presidential adviser. They wore green and white colored scarves that represented the Nigerian flag. The students came from some of the most deprived regions of Nigeria, according to a press release about the program. The soon-to-be Northeastern attendees are required to complete a summer bridge term at Northeastern before they join the University’s sophomore class in the fall.